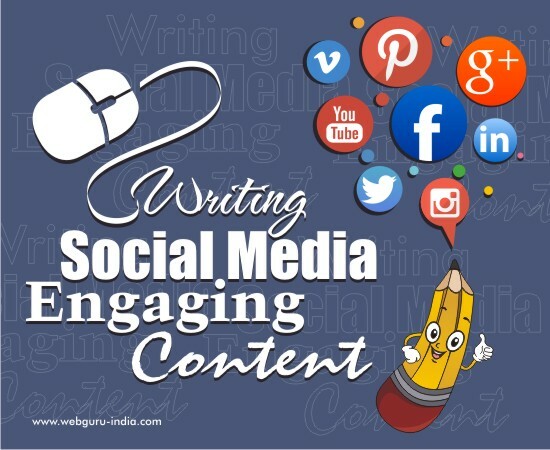 How to Write a Social Media Engaging Content? It is always a good idea to infuse writing with a little bit of emotion, controversy and popular culture at times. People like to interact with social media profiles that offers information which makes them think, feel or even the need to act. However, it is important to remember that offending contents should be avoided at all costs so as not to make it a bitter experience for the visitors. Those who are used to writing contents for traditional channels would definitely want to maintain a level of formality – jargon, buzzwords and business speak – within their contents. But, it does not work out well with social media content. It is more about conversing with the audience therefore, the tone of the writing should be chatty, informal and light. It is better to imagine that the content is addressed towards friends rather than prospects. While it may be a great idea to come up with content related to the interests of the followers, it is also crucial to ensure that the content remains relevant to the business. After all, it is the information provided that holds utmost importance when it comes to attracting more number of followers. Simple language, short sentences and plain English are the key factors to write engaging content that gets admired and shared. Use of redundant words like just, really and very are better to avoid along with abbreviations as they don’t look good from a business point of view. The basic idea is to inspire, entertain and inform the followers while keeping in mind the objectives of the business. Majority of social media platforms are available with analytics information that helps marketers to keep a close watch on the social media content. Valuable information can be obtained from these tools regarding how followers engage with the contents and what type of contents gets the best response. Proper monitoring ensures that followers can be provided with content they like which ultimately helps with increased business exposure and visibility. Getting a good grip of the analytics, helps businesses to understand what can tick for the customers. These are not any hard and fast rules which need to be followed by every content writer but it certainly helps to create contents that are informative, engaging and unique. These simple advices if maintained on a daily basis can ensure that followers come back again and again to a business social media profile.